I Luv Giveaways!! 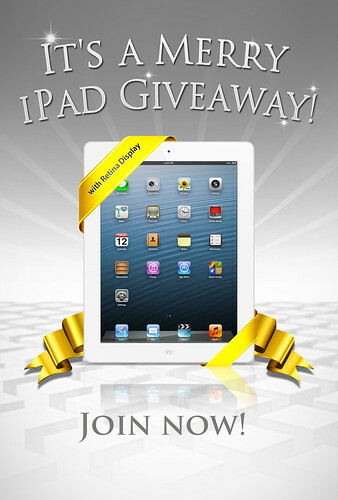 : Join the Merry iPad Giveaway! Contests, Freebies, Coupons, Discounts, Contests, & more!! It's been a long time since I've joined another contest or giveaway but when I stumble this awesome giveaway I know i should not miss this chance to win a 16 GB 4th Generation iPad! To join the contest, Simple Rafflecopter entries are required. The giveaway will run from December 2 until Sunday, December 30 – so you have a whole month to complete the entries and earn points with daily entries too. It’s open to everyone - worldwide - one winner will receive an iPad with retina display, or the cash equivalent of $499 via Paypal whichever is preferred! To join click here. Welcome to I LuV GiVeAwaYs! If you're new here, you may want to subscribe to my RSS feed or email digest for free updates. Thanks for visiting!